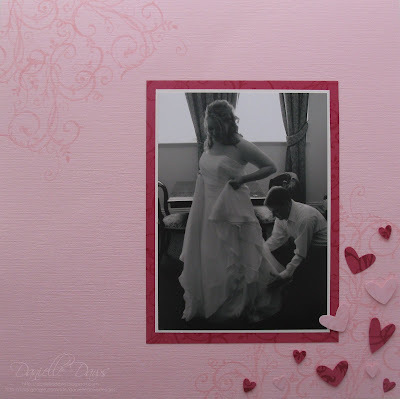 As you all are probably aware, Valentines Day is just around the corner so we thought it would be an appropriate time to get you inspired into all things lovey-dovey with this weeks challenge! Stamp it, punch it, stick it on - it's up to you! Thanks again to the lovely ladies on our Design Team for putting some wonderful projects together to inspire our creative readers. You are welcome to use any brand of supplies for our challenges. Please use the keyword JAI2 when uploading to public galleries. We welcome you to mention our challenges and/or provide a link. Provide a DIRECT LINK to the post on your blog where you've displayed your creation using Mr. Linky. Incorrect links are NOT eligible for Top 5 picks, and may be deleted. Mr. Linky will close Wednesday 3rd February at midnight (12am) EST. Be here on Thursday 4th February to see our Top Picks. What a huge and wonderful first week we have had at Just Add Ink! Thank you and congratulations to everyone that participated and sent in your amazing creations - they were all so beautiful. A big thanks also goes out to those of you who left wonderful comments here at Just Add Ink, we really appreciate them and we just wanted you to know how much your support and kind comments means to us. Without further ado, let's announce the winners! I know you challenge junkies will have heard this on aaaaaall the other challenge blogs, but honestly, it was so hard to whittle it down to just 5 creations for the Top 5, so we've decided to feature some contributors that we were greatly inspired by too! Here are the Top 5 (in no particular order) for this weeks challenge. You all get a badge (below) to display proudly on your blog. Please go and check out their creations in more detail on their blogs, and please leave a little comment love. Click HERE for helping adding the badge to your blog. Claire Dauncey, come on down! !Please email us at just-add-ink@hotmail.com to claim your prize. Thanks again everyone for having fun and playing along here at Just Add Ink! We hope to see you all back here tomorrow for our next challenge - Just Add...??? 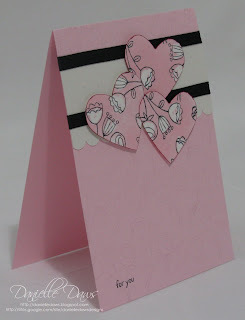 For a pdf copy of this tutorial, click HERE. 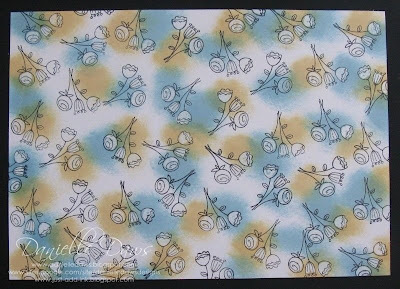 Crayon Resist is a simple, but very effective technique that can be used with most stamp sets. 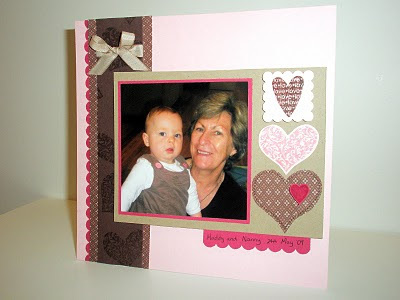 It's relatively easy and it can be used for creating one card, or multiples. Can't beat that! 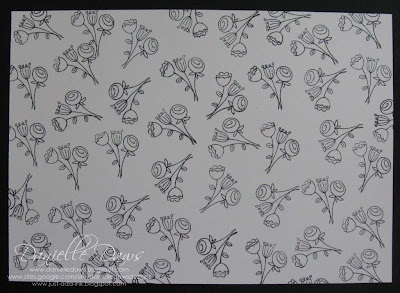 Using Black Stazon ink, stamp your image/s onto the Whisper White cardstock. 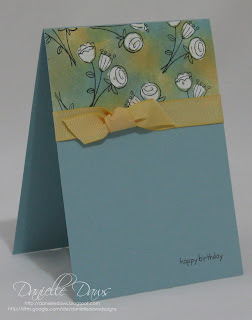 In this tutorial, I’ve created an entire sheet to use like Designer Series Paper (DSP). Stazon is the best ink to use because it’s permanent and won’t smudge later when you’re blending your inks. 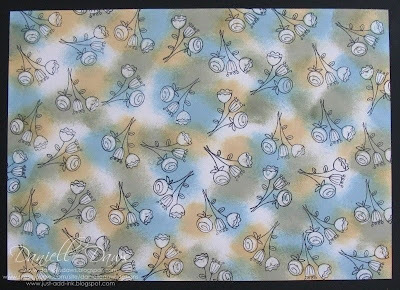 Using a white wax crayon (water soluble crayons won’t give you the same effect), roughly colour the parts of your image that you want to remain white. 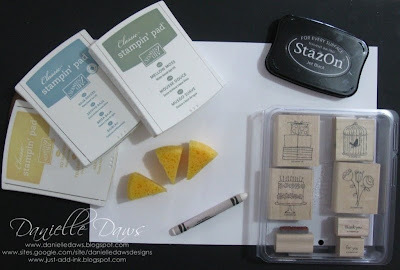 Cut a Stampin’ Sponge into smaller pieces so you can use them for separate colours (it’s also more economical and easier to handle). 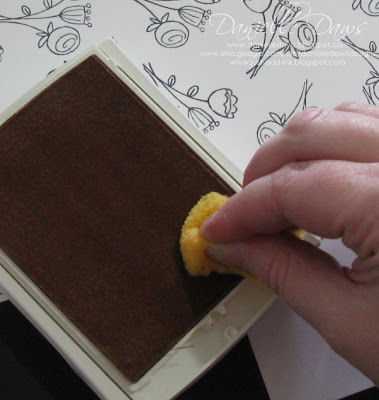 Ink your first piece of sponge with the ink pad you’re using first. I’m using So Saffron first as it’s the lightest of the three. 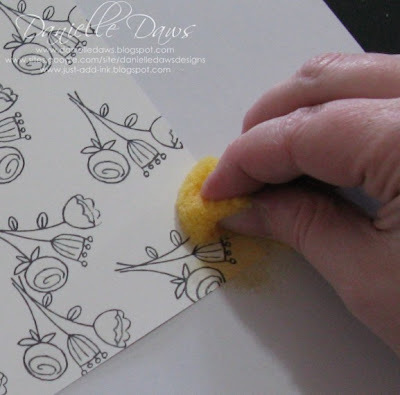 Pick a spot to begin, and gently sponge the ink onto the card stock. It's best to start gently so you can work out the best pressure to apply for the effect you're going for. For this project, I'm going to be applying 3 colours over the entire sheet. For the first layer I'll be applying large "dots" of ink evenly across the page. It's better to apply too little than too much, because you can always go back to apply more later. NOTE: Please be aware of the card stock you're using. 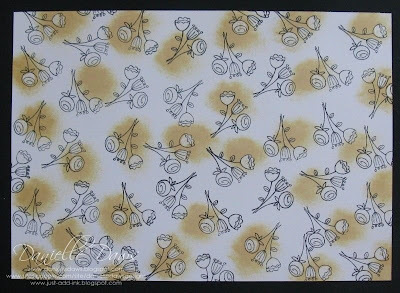 Whisper White is fantastic for soaking up ink, so the effect you've created will subtly change as you're going. ...then Mellow Moss for the third layer. I've left some white space so I can go back with each ink and even out the overall colour effect. I'm aiming for an even distribution of colours, so I don't want to end up with no room to move after applying the two darker inks. 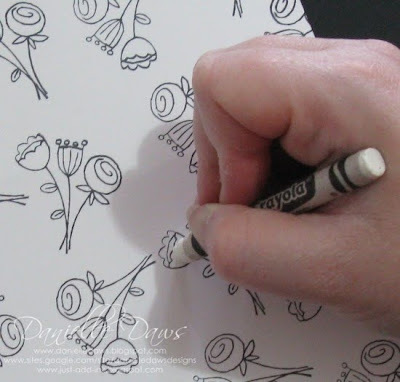 Once you've finished evening out the colours, gently rub a tissue or piece of paper towel over the sheet to remove the ink that is sitting on top of the crayon. Now you're ready to make your projects using your unique DSP. I hope you found this tutorial useful - I'd love to know what you think! 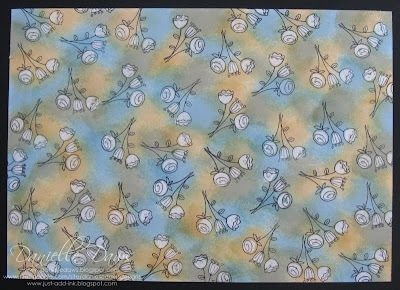 I'd also love to see any projects that are made using this technique - just leave a link to your blog with a note in the comments section. 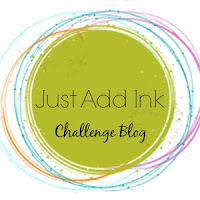 Just Add Ink Challenge 1 - A Colour Challenge! 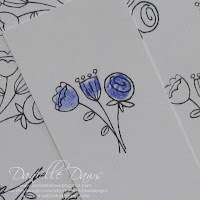 The Just Add Ink Design Team is a group of Australian & New Zealand Stampin' Up! demonstrators who love to share what they love and inspire others to create! We use primarily Stampin' Up! products in our challenge designs, but we welcome the use of any brand or product by our participants. 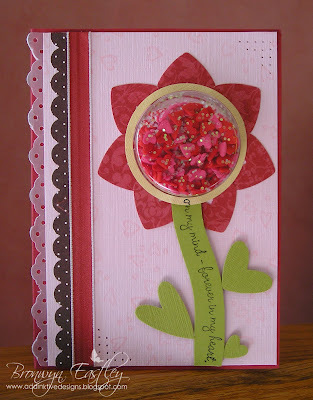 It's our goal at Just Add Ink to inspire our virtual stamping pals, while sharing and having fun! We hope you will play along!! 4) add a link to your creation below via Mr Linky. 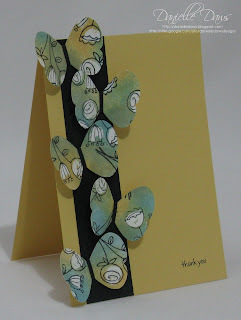 Our first challenge is a colour challenge - make something using our blog colours. 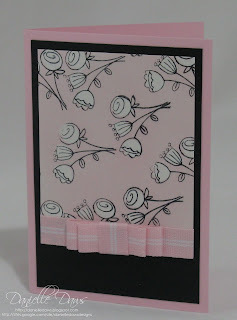 This can be a card, scrapbooking layout or 3D project. Please use the keyword JAI1 when uploading to public galleries. We welcome you to mention our challenges and/or provide a link. To be eligible for this weeks prize you must also 1) become a follower of our challenge blog, 2) add our badge to your blog, and 3) write a short post on your blog about our site! Mr. Linky will close Wednesday 27th January at midnight (12am) EST. 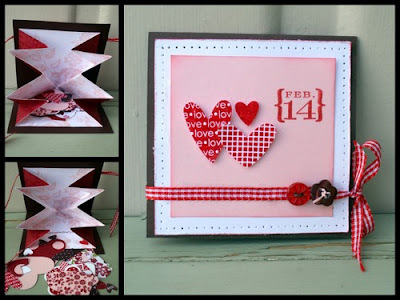 Be here on Thursday 28th January to see our Top Picks and the winner of the $50 Stampin' Up! voucher (drawn via random.org). and we'll enter it for you! 5. Mae Collins (Tas, AUS) - correct link! We've been absolutely blown away by the response to our launch! Not only have there been many wonderful comments left for us, and lovely emails sent, but the entries for our first challenge have been AMAZING! If you haven't already entered, the cut off time is midnight on Wednesday 27th of January. Just over one day to go! Here's a slideshow of the entries we have so far. We'd like to encourage you to visit the entries (links are on the challenge page) and leave some comments - everyone likes getting positive feedback! 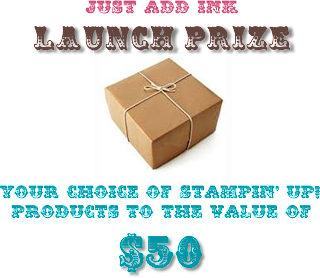 For the Launch Week Only we have a special RANDOM Stampin' Up! prize up for grabs! 4) add a link to your creation via Mr Linky. Only Australian and New Zealand entrants are eligible for the prize - sorry! This is due to Stampin' Up! regulations. The winner will be chosen randomly - good luck!